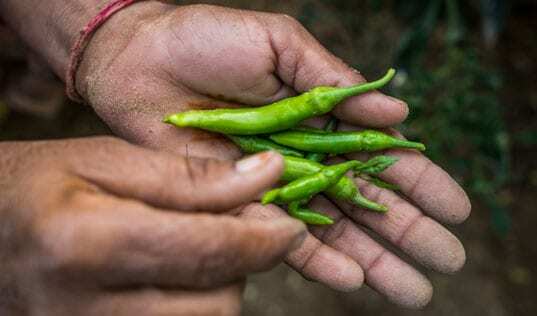 This post originally appeared on Business Fights Poverty as part of a three-part series with The Coca-Cola Company, TechnoServe and the Corporate Social Responsibility Initiative (CSRI) at Harvard Kennedy School. The series complements a new report prepared by CSRI, Project Nurture: Partnering for Business Opportunity and Development Impact. 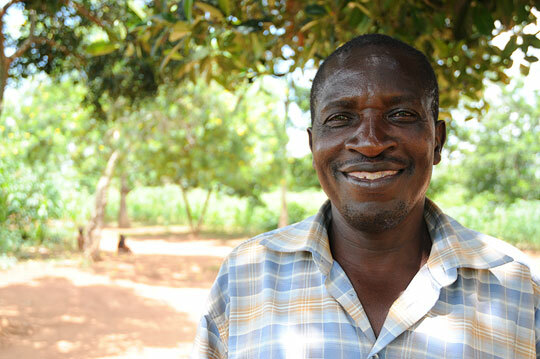 Sam Koole, chairman of the Kainja Mango Farmers Association in eastern Uganda, cultivates a local variety of mango that was previously overlooked as a source of income. In eastern Uganda, the members of the Kainja Mango Farmers Association once let their mangoes fall to the ground and rot. Buyers considered the local variety, the Sena, to be too low-quality for pulping and juicing. As a result, farmers never cultivated mangoes as a cash crop. Project Nurture, a partnership with The Coca-Cola Company, the Bill & Melinda Gates Foundation and TechnoServe, helped unlock the value of the Sena. TechnoServe advisors demonstrated to buyers that the Sena, in fact, produced sweet-tasting juice with a rich color. One major buyer invested in a new piece of equipment to process the variety. It wasn’t until they actually saw, with their own eyes, the people coming here to buy all our mangoes that they started believing. 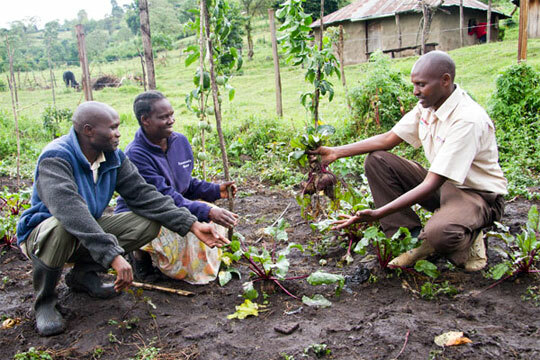 Project Nurture is helping this type of change take root in farming communities across Kenya and Uganda. We aim to help more than 50,000 small-scale mango and passion fruit farmers double their fruit incomes. Together, actors from across the value chain are laying the groundwork for a thriving, sustainable industry that can help farming families lift themselves out of poverty. Creating sustainable impact like this requires a thoughtful approach to strengthening the market systems for mango and passion fruit. And the structure of the partnership adds a layer of complexity. The core partners in Project Nurture – a multinational corporation, a private foundation and an international nonprofit – each bring different perspectives, incentives and expertise. 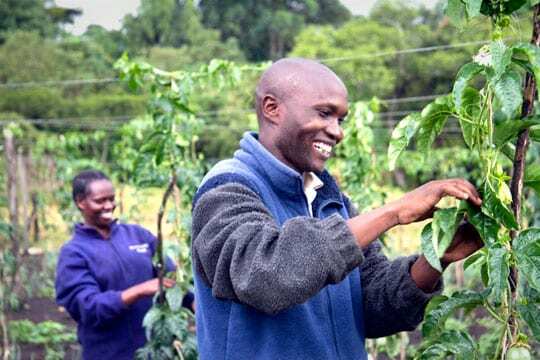 Isaac Kirior (right), chairman of the Tiret Self-Help Group, and member Eusila Lelei tend purple passion fruit vines in the highlands of western Kenya. 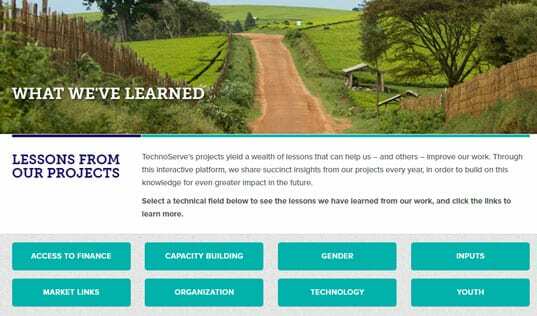 For TechnoServe, the most important lesson learned from Project Nurture has been the benefit of investing in the time, people and processes to ensure that the partnership functions smoothly. The early stages of an ambitious undertaking like Project Nurture will inevitably be marked by moments of uncertainty and doubt. Maintaining the focus on a common goal, open communication and proper planning help ensure that organizations can weather early challenges and reach the point where impact on the ground becomes apparent. Project Nurture has been able to achieve success because the core partners worked together at the outset to establish trust and confidence in one another, and to design structures for the partnership that facilitated regular and open communication about challenges. Key personnel across the partner organizations worked together to co-create the program and develop operating, governance and communications protocols. This allowed the partners to tackle the complicated challenge of jumpstarting the mango and passion fruit industries across two countries. Project Nurture has joined forces with a number of local organizations, including farm support service providers, agricultural research institutes, financial institutions, processors, beverage manufacturers, exporters and national governments. This broad scope is vital in order to ensure that the improvements sparked by Project Nurture last long after the project ends. 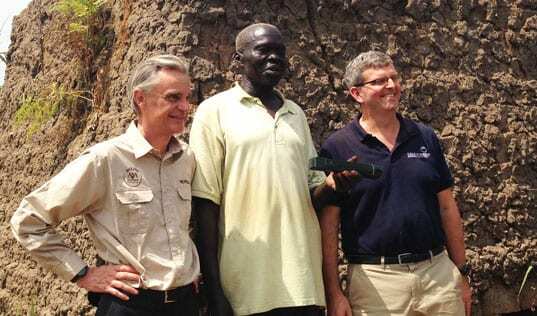 Isaac and Eusila attend a farmer training session with TechnoServe business advisor David Limu. As we have worked in this complex environment, Project Nurture’s operating and governance structures have helped us stay focused, face challenges and solve problems together. The project’s Core Operating Team and Steering Committee have been critical in aligning objectives and managing complexity, both among and within partners. They established regular opportunities for individuals across organizations to interact and build trust. These structures have also facilitated learning and course correction. The result of this hard work is on-the-ground impact that benefits farming families like those of the Kainja Mango Farmers Association. Project Nurture is helping to prove that smallholder farmers can generate meaningful income through fruit production and be competitive suppliers in a market system. It’s a slow and deliberate process, but eventually the economic activity gains momentum and becomes self-sustaining. Our experience with Project Nurture shows that taking the time to lay the foundation for success can lead to sustainable change. Learn more about the power and complexity of cross-sector partnerships in a post from Coca-Cola. Find out which lesson from Project Nurture, from the perspective of CSRI, is most significant for the future of inclusive business.